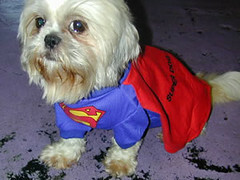 Itchmo: News For Dogs & Cats » Blog Archive » Does Your Dog Have Super Powers? Does Your Dog Have Super Powers? Is your dog cute? Is your dog super tricky? Or super talented? You can enter your special dog in Disney.com’s Underdog Super Pet Contest. Submit a video or photo of your dog doing some thing super, and if your dog wins, he/she will be part of the Underdog movie and you and your dog will win a trip to the world premiere. Get those cameras rolling and your dog can be on the big screen! This entry was posted on Tuesday, May 15th, 2007 at 3:55 am	and is filed under Dogs, National Dog, Cat & Pet Info, Entertainment About Pets, Misc. Pet Info.. You can follow any responses to this entry through the RSS 2.0 feed. Both comments and pings are currently closed. My dog knows how to dance open doors and attack and has a amazingly loud bark.